Iverson said he would pick from the list, play without a break and anyone who needed a cocktail was allowed to get one. Then he began, relaxed, right into the music, playing one-handed while consulting his list and taking a drink from the floor, playing with such an easy, flowing feel. From time to time his head was thrown back, momentarily avoiding the harsh, hard shadow cast across his head by the spotlight. For many jazz lovers much more familiar with standards than me — I cringe momentarily at my paucity of knowledge, but there’s no point in trying to hide it — part of the joy would have been in recognising the tunes Iverson picked. I believe from the requests he played Lover Man, Tenderly, Green Dolphin Street and finished with deep, grumbling take on I Can’t Get Started. Anyway, it seemed to me that his standards were high (sorry) and it was a very laid-back and pleasant way to begin a gig. All we needed was a Manhattan skyline out the window. Wilson’s quintet was welcomed warmly — understandably given the line-up: Julien on saxophones, Colin Hopkins on piano (great to hear him again), the ubiquitous and talented Stephen Magnusson on guitar and popular Sam Anning on bass. Wilson welcomed visiting drummer Jim Black, with whom he had recently recorded an album. I am slightly confused, but believe their opening track for the night — Magnusson‘s Euge, a tribute to trumpeter Eugene Ball — is titled “Missing” on the provisional instalment of CDs. After that, the quintet plus Black played “five or six tracks we recorded yesterday” as a suite, Always the Engineer, dedicated to Wilson’s father, Warwick. So this was hot off the studio. The suite was an engrossing, long journey of sustained beauty and great power. There were dark passages and it was at times mournful, at other times relentless and unremitting. 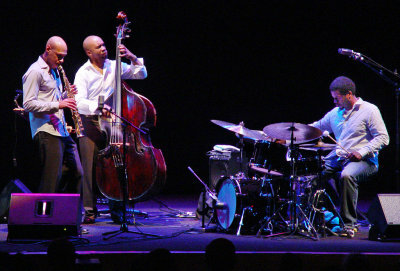 Highlights included the moving introduction by Wilson and Magnusson, drawn-out soprano sax notes in contrast to the drums and guitar pedal effects, deep anguish or thought suggested by Wilson back on tenor sax, a bass solo in which Anning was plucking two strings, and a slow, expressive solo from Magnusson towards the end. Hopkins happily plucked a few piano strings and Black used a bow on the hi-hat edge, as well as dangling bells from his mouth and moving objects across the drum skins. I found that the suite lost its way at one point, and perhaps was a little long. Magnusson’s guitar seemed to get lost at times. And to be honest I found Jim Black a bit overwhelming, but I think there are some great local drummers, such as Niko Schauble and Ken Edie — so I’m probably biased. But no one could come away from this performance without being moved. Bring on the album, Julien. It was surreal under star-studded, translucent blue skies and beneath the lofty, lush palace facades of the Forum Theatre to walk, late, into such sonic frenzy. 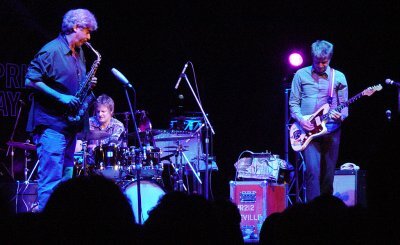 Tim Berne stayed rock solid, moving only his fingers, Jim Black was going bananas on drums and Nels Cline spent almost as much time adjusting his guitar pedals as he did playing. In a maelstrom of sound, with all instruments struggling for ascendancy, no player’s notes were clearly audible. An absence of form and structure seemed to be the aim — if so, it was achieved. As one of Black’s sticks flew up and away backstage and Cline bent repeatedly to fine tune his devices, I had to close my eyes to avoid distraction. This short set — it lasted about half an hour — finished tightly and with flourish. It was the sort of audio extravagance that could work well if you were in the mood — or not as the case might be. I don’t suppose I was. 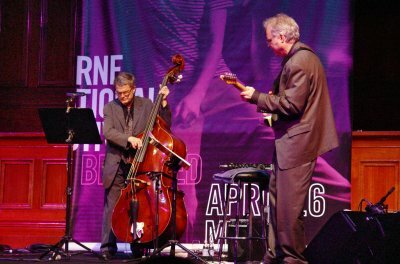 Bill Frisell came on stage to warm applause, accompanied by Tony Scherr, sporting a borrowed, custom-made and unusually slim acoustic bass, and Kenny Wolleson on drums. The program blurb said Frisell “mixes the mastery of jazz, warmth of folk and country, the abstraction of avant garde and the raw emotion of blues and rock” — a tall order — but we began with country blues: Leon Payne’s Lost Highway as sung by Hank Williams. What a contrast to the previous set. Frisell’s lyrical guitar was a joy and there was much interaction between the musicians. The trio eschewed solos, playing almost all the time as a trio throughout the set. As they moved on to Frisell’s Strange Meeting, the guitar was fragile and minimalist. All the impetus seemed to come from Frisell, and at first I thought Scherr and Wolleson were not strongly influencing the result. But it was more that they were not trying to grab the limelight. Over time during Strange Meeting they built up a real swing feel by subtly introducing pauses and adjusting timing. 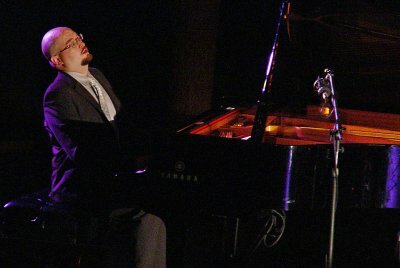 The piece featured lush chords from Frisell and was allowed to subside gracefully, without hurry and with great finesse. On Lee Konitz’s Subconscious Lee, which was upbeat and slightly faster, Frisell’s playing seemed to contribute so much to the result. Scherr was getting into it, Wolleson showed he was not into histrionics and Frisell continued to drive the piece in his unassuming way — as if he was listening more than leading. These guys were never going to have us up on the seats and cheering, but they were pretty cool nonetheless. 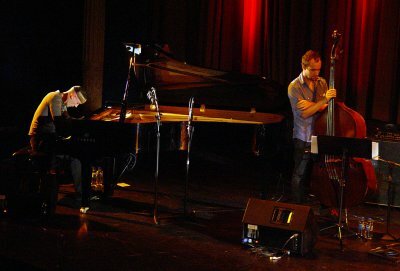 The trio played Ron Carter’s Mood, Henry Mancini’s The Days of Wine and Roses (in which Frisell did solo), Boubacar Traore’s Baba Drame and Frisell’s Keep Your Eyes Open. During these I decided Frisell would probably like the Goldberg Variations without the variations. He seems to love repeating patterns. Baba Drame became involving because of the repetition, taking hold as it developed a tribal feel. Wolleson was integral. I decided the trio was about growth, evolution, the gradual development of each piece. In two encore appearances they played Love Sick Blues, What the World Needs Now, and Frisell’s That Was Then. At last Frisell boosted the volume slightly, which was fantastic. Obviously this trio’s largely restrained set wowed the audience in the packed downstairs area at the Forum. But I could not help wanting the trio to break out and set the room on fire — a fitting end, surely, for a pretty successful Melbourne International Jazz Festival. As it was, I went home to find some more tissues and cough supressant. Of course I am being silly, because the relationship between the street of Grabowsky’s youth and the music he played with Scott Tinkler (trumpet, bucket and water), Genevieve Lacey (recorders) and Niko Schauble (drums) must be much more complex. But it might indeed have been, as Miriam Zolan suggests, a dark forest with wild creatures in the mind of a boy. I certainly recall inventing large and varied landscapes in the wilds of yet-to-be-developed Clayton, and even imagining hiding places in the long grass beside unmade roads. But what of the music played on the instrument with 8000 pipes on Friday evening? I don’t believe I can do justice to the piece, mainly for the banal reason that I was sucking assorted cough suppressants in a desperate bid to quell that noisy urge, and feeling pretty awful. Despite having looked forward greatly to hearing what Grabowsky would do with the organ, I was not able to let it sink in and came away wishing I could hear the composition again. 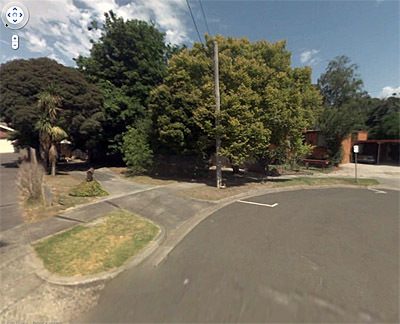 That is of so little help to anyone unable to be there that I will make a few observations. Grabowsky showed how talented he is on all style of keyboards, energetically using the foot pedals and letting nimble fingers roam the keys of the organ. 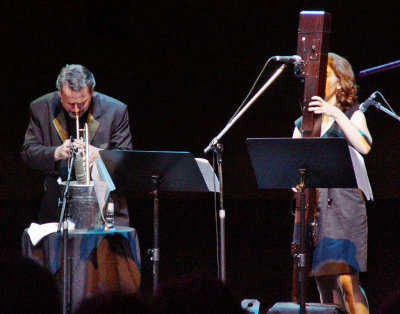 Lacey’s use of the contrabass recorder was intriguing, and also how much she seemed joined to her instruments as she played — almost as if there was an organic connection. But I did not always pick up the sound of the recorders over the other instruments. Tinkler’s trumpet in a bucket, whether with bubbling or without, inevitably caused some merriment among those who had not witnessed it previously. I recall a Melbourne Jazz Fringe Festival concert in the Atrium at Fed Square, when Tinkler played to an enthusiastic audience of about half a dozen on a weekday night as most people were heading home. And his solo album Backwards features some of this, and it was not bucketed by critics. The highlight of Shirley Avenue for me was how well the grand organ and a grand drummer worked together. These musicians have a long history, and at times I thought Grabowsky’s score made use of the organ as if it were a grander version of a Hammond B3, which it is — though much grander. At other times, Grabowsky had the instrument perform more as a generator of pure sounds. But whenever drums and organ came together, it seemed a perfect fit, and this might have been largely due to the understanding between Grabowsky and Schauble, who are world class performers — or at least pretty damn good, because what does “world class” mean? It was a dark piece at times, and complex. It did not thrill by using the immense power of the organ, which I had probably hoped to hear, or feel. But, and this is not giving the commission its due, I would like to hear it performed again — without the urge to cough. It may seem strange to begin with the end, which is what the image above shows. Actually it was taken before the encore. But it is the dynamic between these players that interests me. 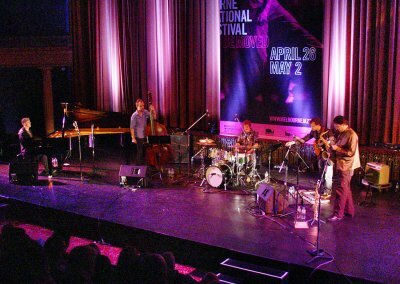 Pianist Ethan Iverson, bassist Charlie Haden and guitarist Bill Frisell had played together previously only at last year’s Newport Jazz Festival, and that might have influenced the Melbourne Town Hall gig. 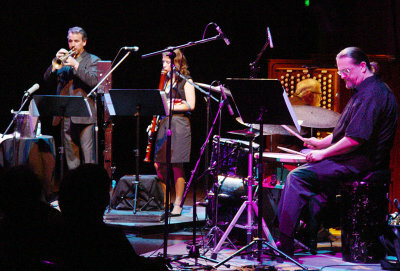 Accorded respect by Iverson and Frisell, Haden seemed not to be fully involved. Perhaps he was merely concentrating. 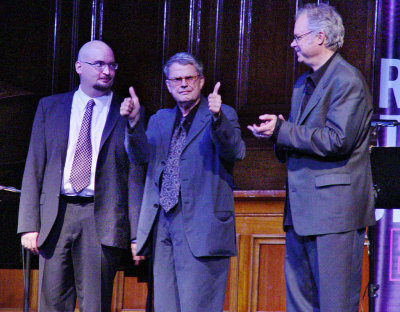 It’s unwise to read too much into one image, but Haden in thumbs-up mode (above) seems to be almost on automatic pilot, while Iverson and Frisell are sharing the moment. And Haden’s lack of engagement seemed to be evident during this concert. Perhaps the trio’s lack of experience together had an effect, or perhaps Haden was festival-lagged. 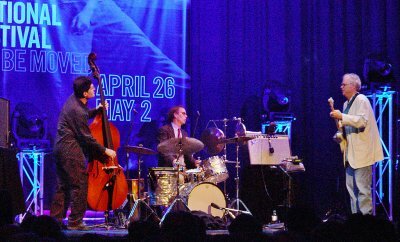 But it often seemed that Haden was looking down, concentrating, or looking at the chart, while Frisell was characteristically facing away from his audience and open to what Haden was doing. Frisell was physically separated, and that seemed also to reduce the interaction. Of course, such superb musicians can play great music in most circumstances, so this is not a claim that their performances were poor. The whole gig had a much lighter feel than I had expected, and Frisell probably had much to do with that. They played the bebop number What (light, bouncy, muted guitar), Haden’s First Song (in which Frisell and Iverson seemed to accord Haden great respect), and Ornette Coleman’s Humpty Dumpty (faster, with some great solos). The followed a sequence of three duos. Frisell’s intro to Bill’s Song, played with Haden, was beautiful. Paul Motian’s The Storyteller on piano and guitar brought a welcome change from the sweetness, with some distortion, contrasting tempos and notes that clashed and jarred — great stuff. 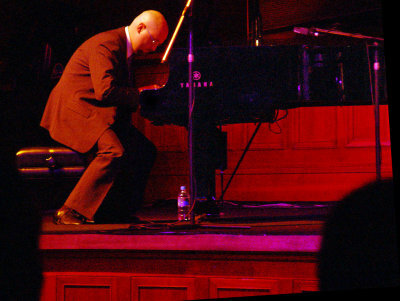 Haden and Iverson played Broken Shadows with simplicity, but the piano was a little lost behind the bass until Iverson took off on a solo journey. Then there was a swinging trio piece (name unknown) in which I became more aware of Frisell being attentive to Haden, but the bassist concentrating on the chart or looking into space. 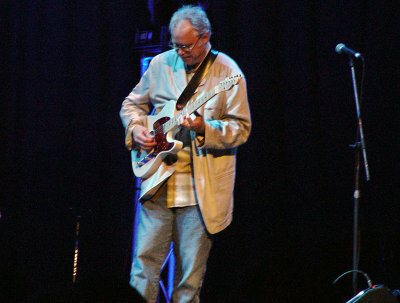 In the encore, Frisell’s guitar was melodic, lyrical and delicate. Perhaps I had wrongly expected more fireworks, more interaction and more spark from these three, given their musical pedigrees. 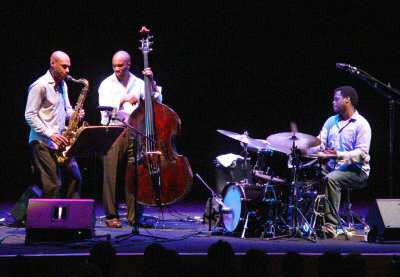 After all, Haden played with Ornette Coleman and Iverson with the Bad Plus. But it was still fine music.